It's closing night at a locally owned supermarket. Lisa (Renée Estevez), a cashier, has an altercation with her ex-boyfriend and has him removed. The managers gather the night crew together and tell them that store is being sold and soon they won't have jobs anymore. Everyone's employment starts ending much sooner then they expect, when a mysterious figure begins killing them off one by one in horrifically gruesome ways. Director, Scott Spiegel, is an associate of Sam Rami (Sam, Ted and even Bruce Campbell have small parts in this film) and his fingerprints are all over several sequences, a POV rotary phone dial shot, a a few moments of slapstick comedy, and of course some way over the top gore sequences. Couple this with the uniqueness of setting a slasher film in a grocery store, and you have a truly fun horror experience. The performances are solid, although the reveal of the killer is a little underwhelming. The mystery surrounding the murderer's identity is pretty obvious, and the red herrings have never been redder. But, you're here for the kills and that's where the movie excels in some truly brutal and unusual deaths. Just make sure you view the unrated version on DVD rather then on Netflix's streaming service. Netflix's cut has been edited to remove nearly every gore scene. The editing is so severe, whole moments are rendered nearly incomprehensible. 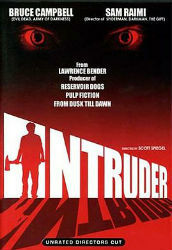 Intruder is a hidden gem in the teeming mass of slasher films, and it's definitely worth your time to check out in all it's gory glory.